Welcome to RussBall.com the site of Artist Russ Ball. are for sale unless someone has beat you to it. 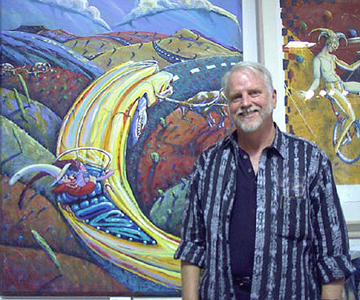 Russ Ball holds a BFA degree from Virginia Commonwealth University in Richmond, Va. and took graduate courses in painting and printmaking at the University of New Mexico. After his release from the Army, Russ moved to New Mexico and became enchanted with the landscape. He painted watercolors of the boulders in Tijeras Canyon, just east of Albuquerque, selling in a gallery in Taos, N.M. to pay for University of New Mexico classes. his artwork to this day. and often layers meanings as he layers his paint. artist through this Web site. his illustrations in the Albuquerque Journal. Richmond, Virginia and is the mother of granddaughter Amber Victoria. Q. How long have you lived in Albuquerque? romantic and different, and in fact, it proved to be wonderfully so. Q. What are your personal impressions of Balloon Fiesta? tend to enjoy the fiesta from around the edges. Q. Have you taken a ride in a hot air balloon? the balloons but have never actually ridden on one. Q. Do you have a Balloon Fiesta story to share? Q. 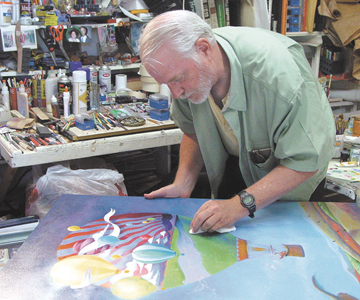 What does it mean to be the poster artist for Balloon Fiesta? as the poster artist is quite an honor and a challenge. Q. How will you "personalize" the 2006 Balloon Fiesta Poster? the painting to transcend its literal meaning. an artist. I have been drawing and painting since I was five years old. reflected in any art I do now. Q. Have you created poster art in the past? poster project that I have worked on. Q. What do you do for fun besides paint? old movies, and love to read about history. Q. What else do you do in your spare time? my studio, I love to put on some good music and paint. Q. What is your favorite piece of your own artwork? My favorite piece is usually the one I am working on at any given time. paintings tend to have meanings other than the literal subject. Q. What makes your work unique? interesting as the subject matter. Q. What would you consider the "Russ Ball" touch? Q. What are your tastes in art? Dali. Toulouse-Lautrec, Degas and Matisse became favorites of mine. in front of it for hours, drifting in an out of the paint splatters. traditional landscape, still life and portraiture as well as cartoons. © 2006 Albuquerque International Balloon Fiesta, Inc.